This junior size shamrock bracelet features a 3/8" wide shamrock charm with gold plated accents and a 1/4" wide Celtic Trinity knot charm with oxidized accents. 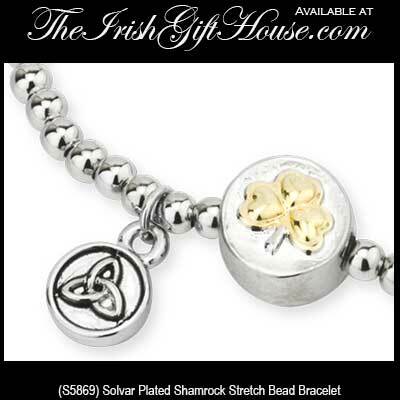 The rhodium plated stretch shamrock bead bracelet measures about 2 1/2" oval when not stretched. Both the shamrock charm and the Celtic knot charm are double sided. This smaller shamrock bracelet is sized for smaller wrists and would be a good size for most teenage girls and small women. 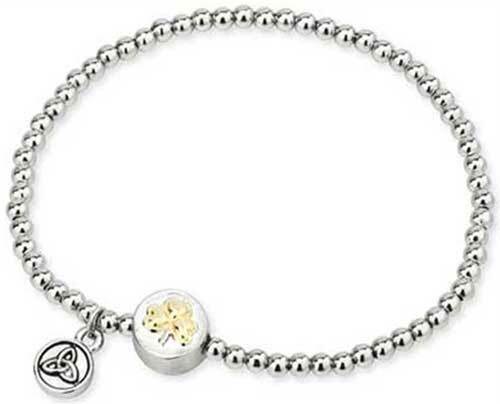 This bracelet is gift boxed with shamrock and Celtic knot history cards, complements of The Irish Gift House. It is part of the Tara Collection that is made by Solvar in Dublin, Ireland.